Description: A small, rounded sedge with narrow stalks up to about 2 feet tall, ending in a sharp point. 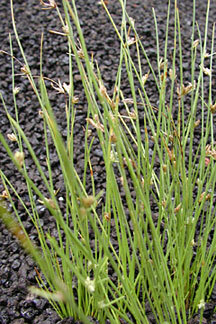 The flowers are small, light brown-gray spikelets that usually come down about an inch or two from the tip, protruding from the side. Distribution: This is an indigenous plant found throughout subtropical regions worldwide. In Hawaii it is most often found in coastal areas on the margins of ponds and marshes on Niihau, Kauai, Oahu, Molokai, Maui, Hawaii and Laysan in the Northwestern part of the chain. Cultural uses: This plant is well known and highly valued by Hawaiians for weaving mats and, more recently, hats. The author Robert Louis Stevenson, during his travels throughout the Pacific, wrote that there were no mats finer than the makaloa mats of Hawaii. Landscape use and care: This plant looks great in ponds and can be used as an accent around rock features. It does best in full sun, and its roots can tolerate being submerged under water. Put the whole pot in the pond and weigh it down with some rocks. It also does well planted in areas of the garden that stay damp. Few pests bother this plant. It is available at both the Iwilei and Pearl City Home Depots for about $9 in 1-gallon water pots. Also: Our lowland streams and marshes are vital habitats for many native flora and fauna and are essential in the prevention of floods. This plant -- along with many other native sedges and rushes, shrubs and ground covers -- is a main component of this ecotype, which is now dominated by alien plants and animals. More work needs to be done to re-establish these zones as native habitats, not only for the plants' and animals' sakes, but to reduce and/or prevent the threat of lowland flooding.